The sleek lines of the RW-500 tower coupled with a beautiful cherry on black finish makes these speakers an instant eye catcher. With 250 watts of power and a side-firing 8" woofer you'll have no problem blowing away your family and friends with their stylish looks and incredible performance. 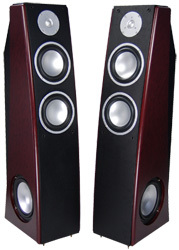 Covering the full range of the sound spectrum with a smooth frequency response these speakers are a shining example of great dynamic speaker design.